Since antiquity, humans have tried to distinguish themselves, whether it’s as individuals, family, by religious belief or nationality. By the 15th century, this need gave rise to family crests, such as the one shown in “Angouleme Crest”. Dating back to the 9th century, the county of Angouleme traces its origins to one of the most important of early counts, William Taillefer. In the 12th century, the title was passed to King John of England upon his marriage to Count Adhemar’s daughter Isabel. As they say, the rest is history as the family crest was passed on from one royal to another, ending with the eldest son of Charles X, who died in 1844. “Angouleme Crest” is as regal as the family name upon which it is based and will give a royal air to your home. 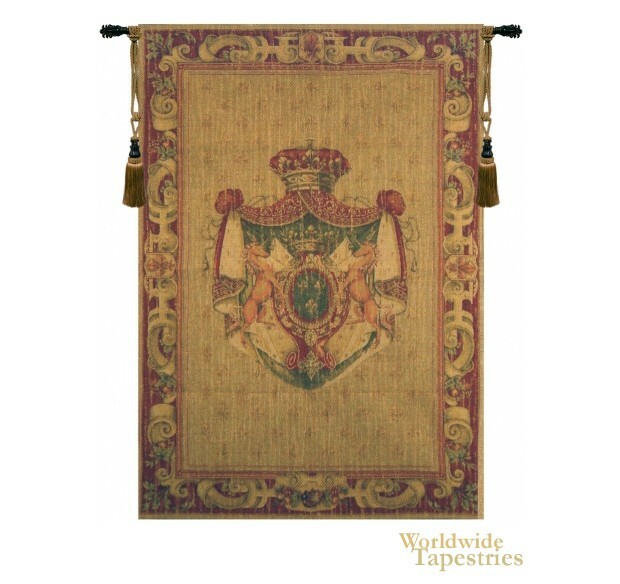 This tapestry is unlined and is finished with a tunnel for easy hanging. Note: Tapestry rod and tassels, where pictured, are not included in the price. Dimensions: W 40" x H 54"